Metfriendly's Ten Year Savings Plan is an excellent way of putting something aside for the future. If you want a simple, long-term savings plan that you can’t dip in and out of then this is ideal for you. NOTE: You can request the first £25 of your monthly premium to be tax-exempt if you are not paying into a tax-exempt plan elsewhere. The tax-exempt part of your savings will be issued as a separate contract. Many of our members also choose to start new plans every year. This can be set up automatically and is known as the Rolling Ten Year Savings Plan and means that after ten years you will start receiving a pay-out every single year – ideal for regular annual events like Christmas, school fees or holidays. Click the “What is the Rolling Ten Year Savings Plan?” FAQ below for full details. Can I cash in earlier? Yes. The plan can be cashed in for a surrender value at any time. You can only cash in the plan completely – we will not permit part surrenders. Once you have been paying premiums for 6 years, the surrender value may exceed what you have paid in – but it could be less in the early years. 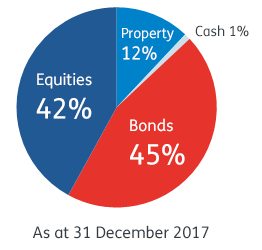 The surrender value reflects our investment return over the period of your savings. On taking money out of either plan there may be tax implications – see ‘What about tax?’ in the key features document. Metfriendly does not make any form of commission. The cost of providing verbal or written information about these plans is included in Metfriendly’s overall expenses. What is the Rolling Ten Year Savings Plan? This example shows how you may set up a Rolling Plan to get a pay-out every January to help with Christmas credit card bill or holiday planning. you begin a Rolling Ten Year Plan in January at £25 per month. each subsequent year you begin another plan at £25 per month. 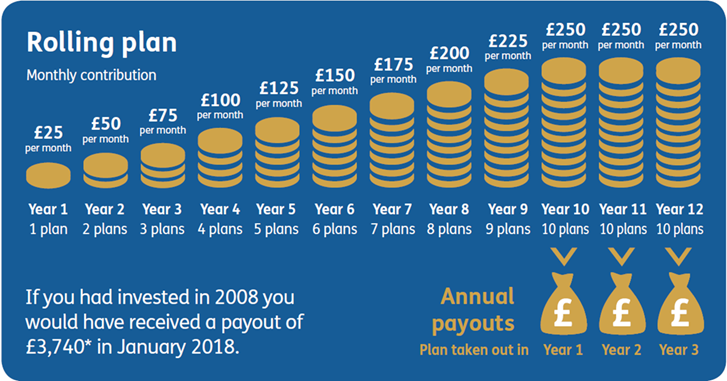 after ten years you will have ten plans running for a total premium of £250 per month. after ten years your first plan will mature paying you the sum assured plus any annual bonuses and normally a final bonus, in good time to help you with the Christmas credit card bill or help towards a holiday. we’ll start a new plan for you after the first ten years to replace the matured one – that way you’ll continue to have ten plans running. early the following January your second plan will mature, again paying you the sum assured plus any annual bonuses and normally a final bonus – Christmas and holiday costs sorted again! and every January thereafter you will receive a pay-out for as long as you wish to carry the Rolling Ten Year Savings Plan on. you will only be able to open new plans until you reach age 55 (50 for a smoker). The image below gives an example of how the rolling plan works. *As at 1 January. Past performance is not a guarantee of future returns.